2. We are under impression that this class is being purchased by the students for personal use only and we are providing this pendrive classes/product for the same purpose. Reproducing lectures or books or any material provided in any format or attempt to breach the security / copy the lecture / share with any party / unauthorized party (authorization will be decided on the basis approval from way to pinnacle institute private limited), copying and delivering lectures etc. will attract strict legal proceedings under Indian laws to its full extent. 9. Package includes Books of GST (One Volume), MCQ + Q & A (One Volume) and a lecture on an average of 2½ hours). Tags: Taxation Pendrive, Pendrive Classes for GST, CA. RAJESH SHARMA SIR Pendrive Classes, CA. 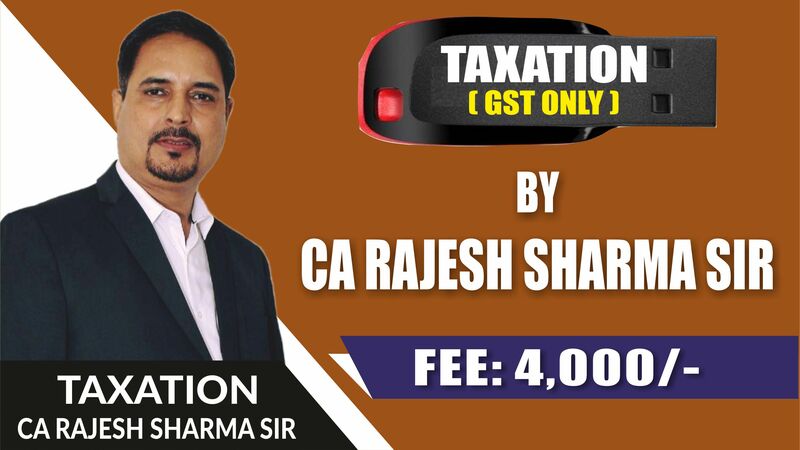 RAJESH SHARMA SIR Pen Drive Classes for GST, GST Pendrive Classes, GST Pendrive Classes For May 19 Attempt.